What you see above is a low-res screenshot of a single page from the timeline software I use to map out the events in a story, the modern version of pinning cards with bits of writing on them all over the wall above your desk. The screenshot is an excerpt from the planning I've been doing for the next Shoal Sequence book, River of Light. If you look at the bottom, you'll see a long cluster of little colour-coded squares - each one of those is an element of the plot, mapped out in chronological sequence. Each line of squares down there represents a separate major character. Essentially, that little bar at the bottom allows you to see the whole thing at one go, while a small part of it is reproduced in rather larger size in the main window. The text, as you can see, is fairly crammed; it's an attempt at reducing the essence of the events of the book, and the order in which they happen, to as few words and virtual cards as possible. A map, basically, to the book before I start writing it. The thing I really like about software like this is that it helps you sort out potential chronological disasters before you start the actual writing. If Tim has to get to the airport at ten in the car, but the assassin you want to kill him before he gets on the plane couldn't possibly have left Moscow yet, you know you've screwed the order of events up somewhere. This kind of software helps sort that kind of problem out, And I really can't be fussed with sticking holes all over the walls of my kitchen, where I work. But with any luck I've finally managed to work out every little detail of the story (the above is separate from a several thousand words long synopsis I already had, and which the above timeline is based on). And if you're a budding writer wanting a go at something like this for that first novel or your NaNoWriMo project, a Google search should turn up a few free alternatives - I paid for my timeline software because I was used to using a freebie version of it I already had, except that it crashed all the time. What software is that? Scrivener? 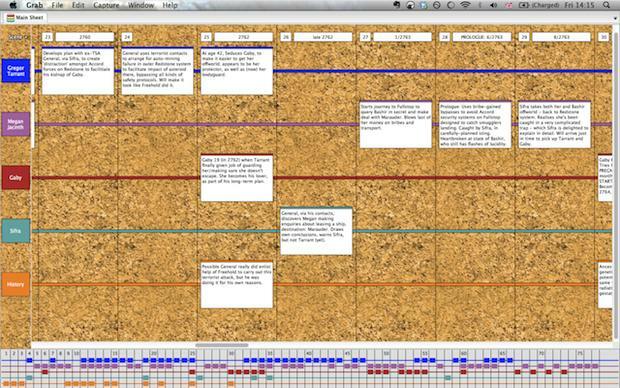 The software is Storylines, and is part of a bundle of software from Writer's Café - http://www.writerscafe.co.uk/. Hey Gary. Been absent from here for a while and have just recieved final days from my wife as a present and am looking forward to sitting down to read it after the pure enjoyment i recieved reading the shoal series. Now your writing a forth book! THANK YOU! You're more than welcome, Andy.